What happens when delectable mango unite with trendy, easy-to-make aquafaba meringue in a mouth-watering sorbet? Read on and find out! It is hard not to simply enjoy the mango as it is. Only with great self-restraint, I managed to purée these tasty slices. Mango is one of my favourite fruits, and avid readers may remember earlier delicious posts on mango ice cream and mango ice pops. 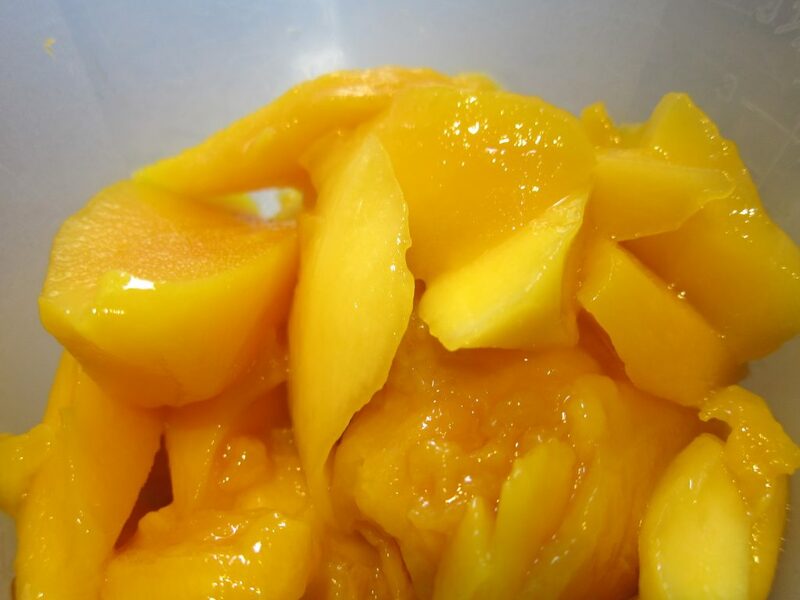 Today, we will prepare a mango sorbet but we will add that little extra: harnessing the “foaming power” of chickpea-water (the kind you typically find in a can of chickpeas), we will add some so-called aquafaba meringue during the churning! If all goes according to plan, the result should be on par with those normally only achieved by the addition of Italian meringue. Aquafaba, however, will both be easier to make and contains no eggs! Start by making a fruit purée out of the mangoes. Add the lime juice, prepare a simple sugar syrup, and mix it all together. My trusty handheld mixer has successfully combined the sugar syrup with the fruit purée and some lime juice. Simple sugar syrup (= a mix of sugar and water) is a core ingredient when making sorbets. But since the Aquafaba meringue also contains sugar, the sugar syrup’s ‘normal’ sugar content needs to be reduced: otherwise, the end-result would turn out sickeningly sweet. I would suggest making a simple sugar syrup with 1.5 parts water to 1 part sugar. Traditionalists may bring the sugar syrup to the boil until the sugar has completely dissolved, then let it cool down before using it. Or simply do it the quick way – just mix cold water and the sugar and whisk/shake well until the sugar has dissolved. 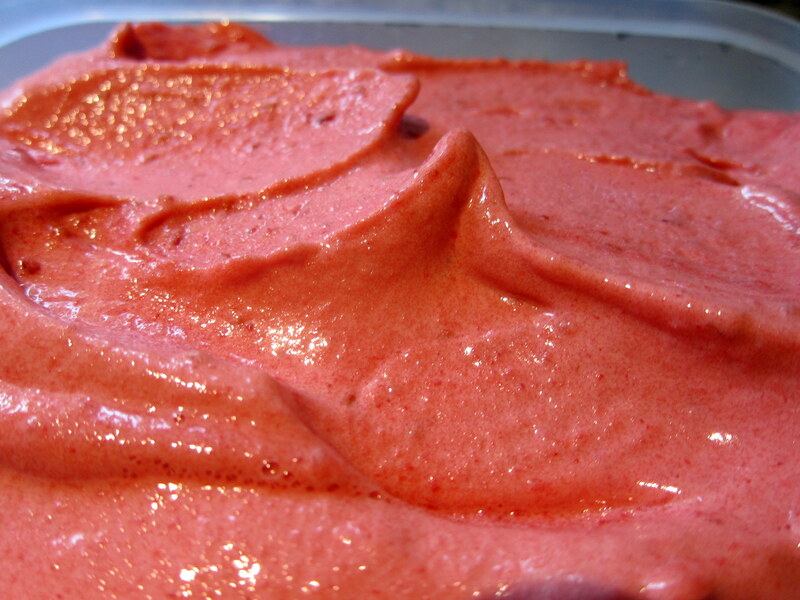 Then begin to churn this sorbet base in your ice cream machine. Remberber, though, that towards the end of the churning, we will add the aquafaba meringue! This is really very simple – unless you prefer to soak and cook your chickpeas yourself, simply get yourself a can of chickpeas and use the liquid (“the aquafaba”) therein. 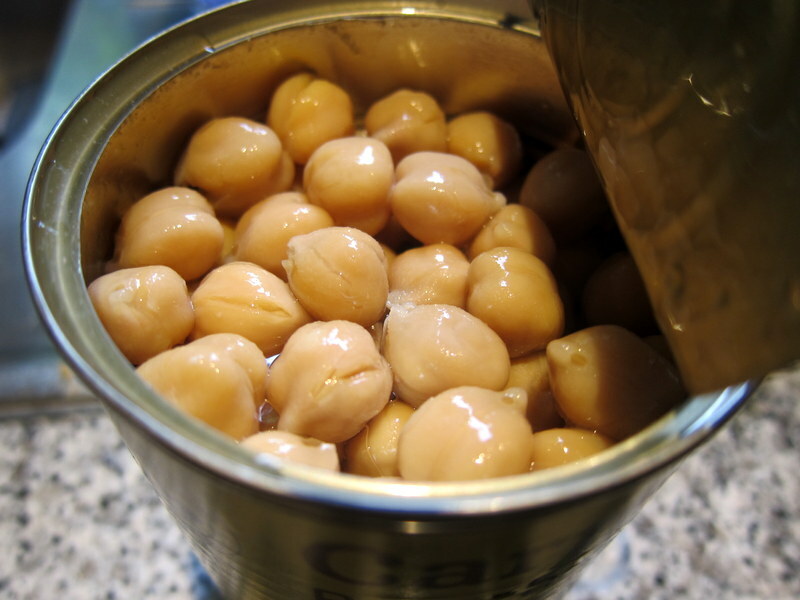 The quick and easy way to aquafaba – open a can of chickpeas and collect the liquid! Get hold of a whisk, or put the aquafaba in a suitable food processor and whisk until it begins to stiffen. Continue to whisk and add sugar. Whisk until the aquafaba has stiffened comfortably – finished! The whole process should only take about five minutes or so. Congratulations – You now have the functional equivalent to soft Italian meringue, the classic sorbet improver! Italian meringue? No, this is actually Aquafaba meringue! For all practical purposes a perfect companion to your sorbets! Still unsure? 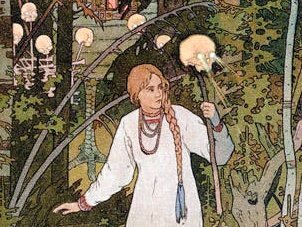 Go to this recent post, which explains the process in even further detail! Just stand and watch while the aquafaba become an integral part of the sorbet, adding a healthy dose of captured air and improved consistency in the process. The aquafaba meringue used in this picture actually comes straight from the freezer: Just like Italian meringue, any surplus aquafaba meringue can be saved there for future use! Verdict: Aquafaba continues to impress! 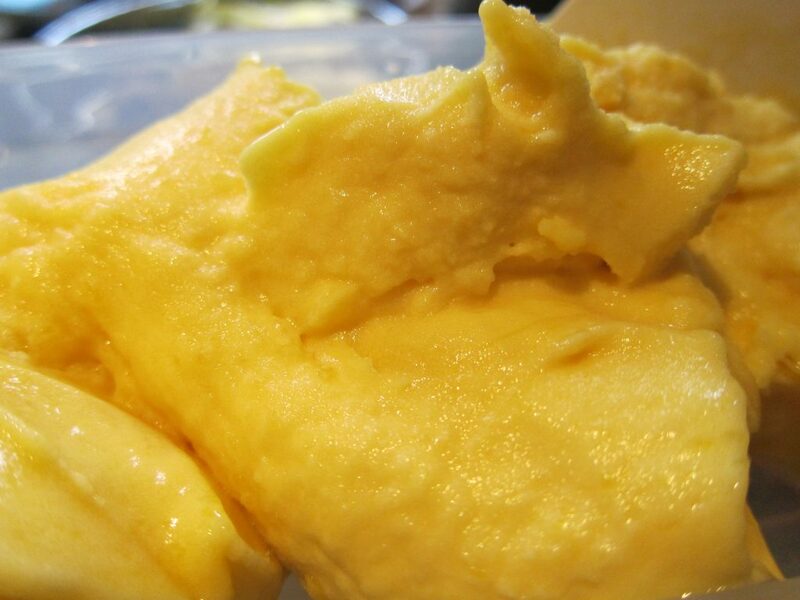 Mango Aquafaba sorbet straight from the churning: just as delicious as it looks! The mango sorbet, prepared with the aquafaba meringue, became an instant hit. By the time I had finished saying “aquafaba”, most of the batch had already been devoured by delighted family members and friends. Guess if they made wide eyes when I told them that the sorbet they so enjoyed was a mix of mangoes and chickpeas? Italian meringue is the classic improver of sorbets, but I can honestly testify that aquafaba meringue is equally impressive (and so much easier to make). While mango sorbet arguably is nice already in its basic shape, the aquafaba meringue does add a lushious extra dimension in terms of improved texture and structure – improvements which also add to the sorbet’s overall mouthfeel and, arguably, flavour. Since the recipe is so very easy, there is really very little excuse not to test it: given the added stability provided by the aquafaba meringue, the recipe is also extra well suited for those wishing to make ice cream without an ice cream maker. 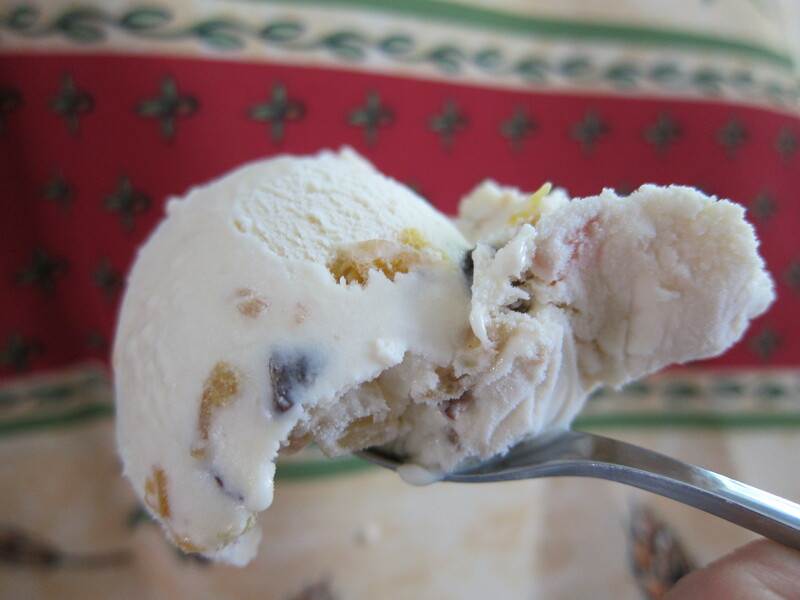 And in case you worry – No, the sorbet does not taste of chickpeas! Not even a trace. The glorious mango flavour rules surpreme, as it should! Go on, and delight yourself and your loved ones! 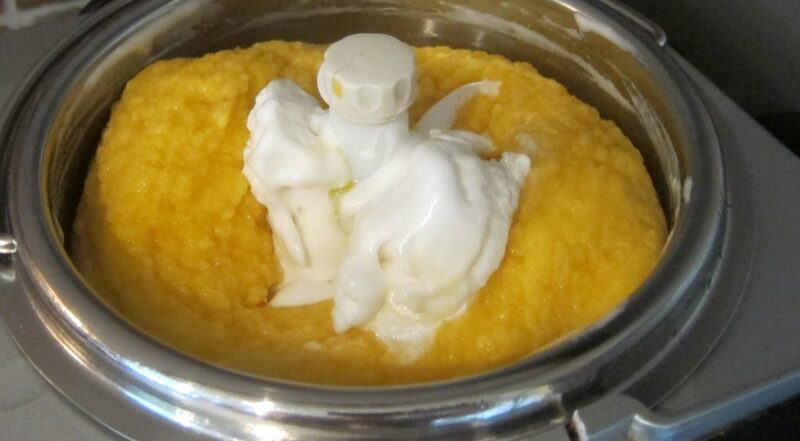 Delicious mango sorbet gets the royal treatment in a modern way! Instead of adding the classic, traditional Italian meringue to enhance the sorbet experience, we're adding aquafaba! No eggs and still all those nice benefits of Italian meringue! about 100-150 ml Aquafaba meringue, made from about 150 ml (2/3 cup) of aquafaba (= the watery liquid typically found in a can of chickpeas) and about 130 gram (2/3 cup) of sugar. Purée the peeled mango and add the lime juice. Prepare the simple sugar syrup [NOTE: here with a reduced amount of sugar, in order to adjust for the sugar to be added through the Aquafaba meringue]. 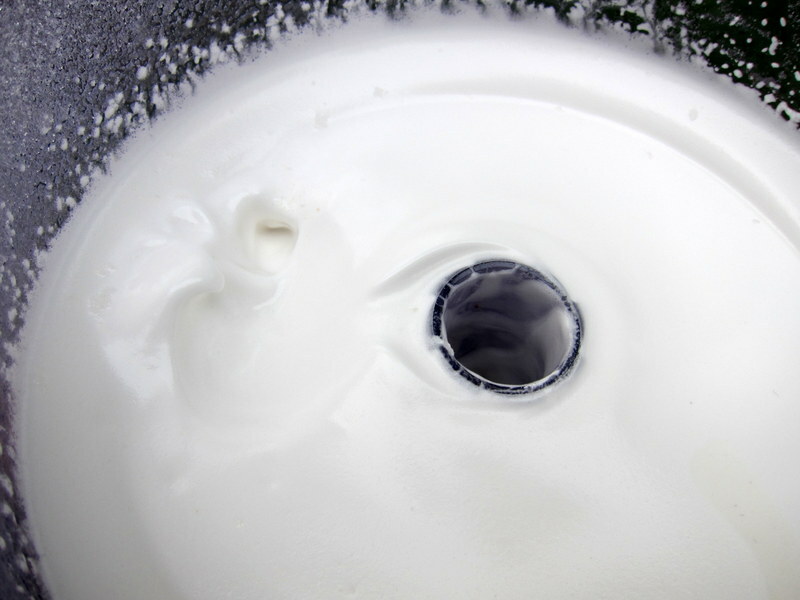 Prepare the Aquafaba meringue [see below]. 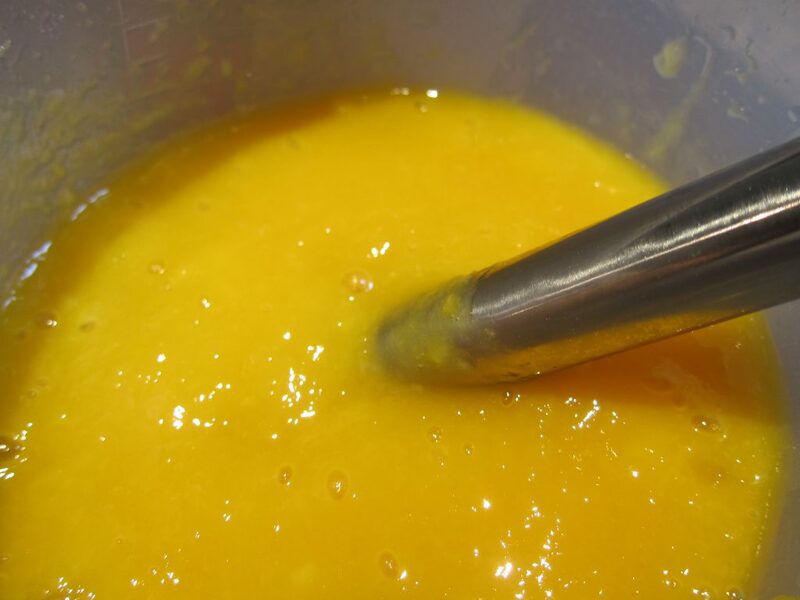 Mix the mango purée with the sugar syrup for the sorbet and churn in your ice cream machine according to instructions. When the sorbet is almost ready, add about 150-200 ml (about ⅔ cup) of the Aquafaba meringue. Whisk well and continue to churn a little in your ice cream machine, or transfer the sorbet to a freezer-safe container straight away, cover it with plastic film and a lid and put it in the freezer. Whisk the aquafaba (suggestively, in a household assistant) for a few minutes until the liquid has stiffened somewhat and begun to turn white. Continue whisking and add the sugar, tablespoon for tablespoon. Whisk until the aquafaba has stiffened so much that it stays in the bowl if the bowl is turned upside down (should take about 5-10 minutes, tops): Ready! Great Recipe Anders, i am trying to achieve something similar with Lemon sorbet, something i tried from Slovenija. You might also want to check Raspberry infused with Rose sorbet too. Wow, this recipe looks amazing; I am going to try it out since I so happen to have a lot of mango at home at the moment! About aquafaba, would you say that it is more stable in sorbets than French meringue? Would you even say that it is as stable or close to as stable as Italian meringue? By the way, I recently tried making coffee sorbet with Italian meringue, corresponding to 1 egg white for almost 3 cups of water in the original sorbet recipe, which seems to be what you recommend too. However, the result was something that was so incredibly soft / full of air that it would just melt away in the mouth and couldn’t be chewed like other sorbets or ice cream I have had can be. So I tried to just add some more freshly brewed coffee to the sorbet and nothing else, give it a mix in the food processor and then churn it in the ice cream maker again, to reduce the relative amount of meringue and sugar and hopefully make it a bit firmer and more solid. The result was something that was even more soft and fluffy(! ), so quite the opposite of what I was looking for. I would estimate that it almost doubled in volume, more than what the added coffee could account for. Do you know why this happened? To explain the texture, do you know what powder snow is like – it cannot be easily formed into any shape and doesn’t hold together very well? That is what my sorbet was like. 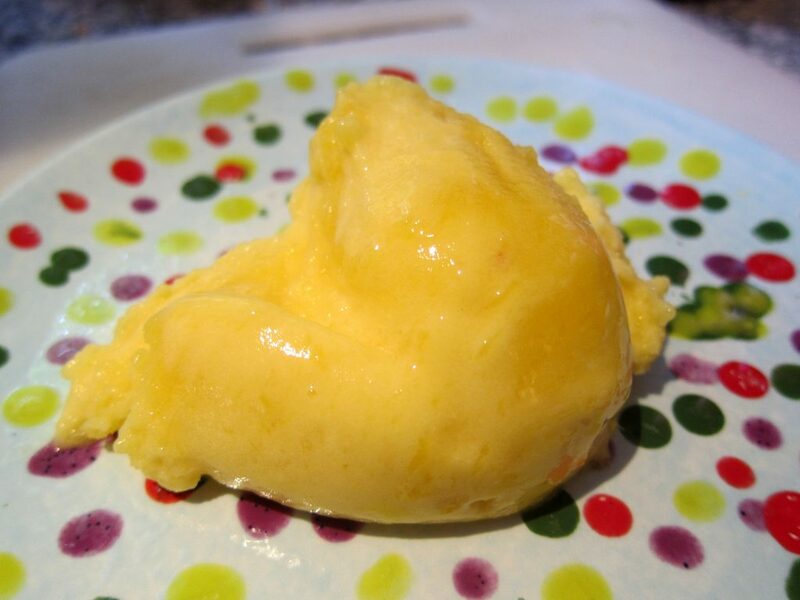 I’m not sure about what exactly might have gone wrong for you: Assuming that you made the Italian meringue correctly, it seems at least abundantly clear that what you added simply turned out to be too much – instead of sorbet, it sounds like you created its airy ‘cousin’ spoom. I can only speculate about what happened when you tried to save the situation – my guess is that the extra round in the food processor might have added even more air to the overall result. While spooms can be very pleasant in their own way (as I hope your coffee spoom was too, despite all), I do understand that it is less fun when they come unwanted, like this. Next time, try to add the Italian meringue to the sorbet little by little, rather than all in one go, and monitor the consistency before you add more. Don’t give up and best of luck! Yes, the taste was still good, just a bit funny texture. I will definitely try adding the meringue little by little next time as you said!